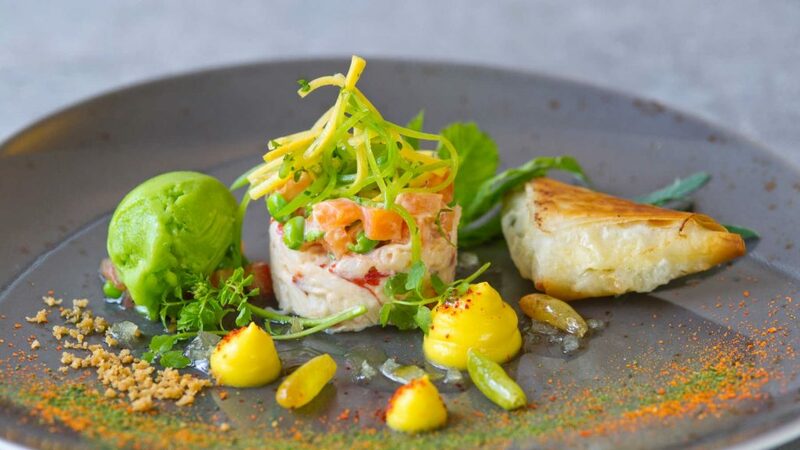 There is nothing quite like award-winning seafood, especially seafood designed and lovingly created by Chef Pascal Proyart at the beautifully renovated One-O-One Restaurant at the Sheraton Park Tower. My dinner guest and I were there at the invitation of Stephane, the elegant restaurant manager, to sample the newly created menu and first class hospitality. 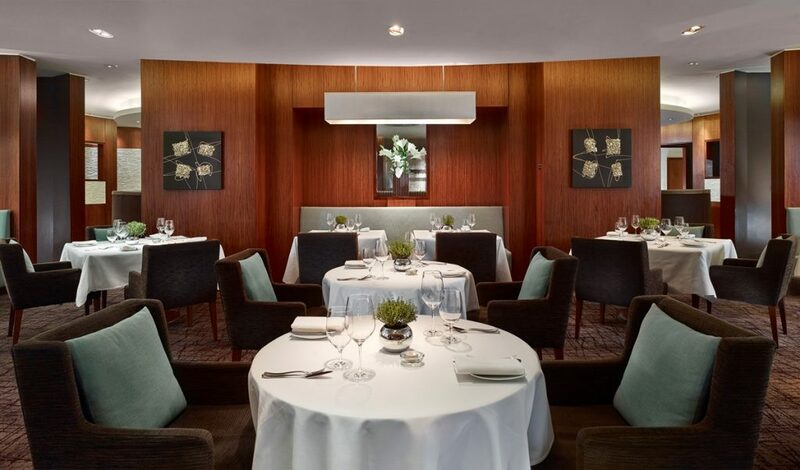 We are shown to our seat in the luxurious salon style dining room. 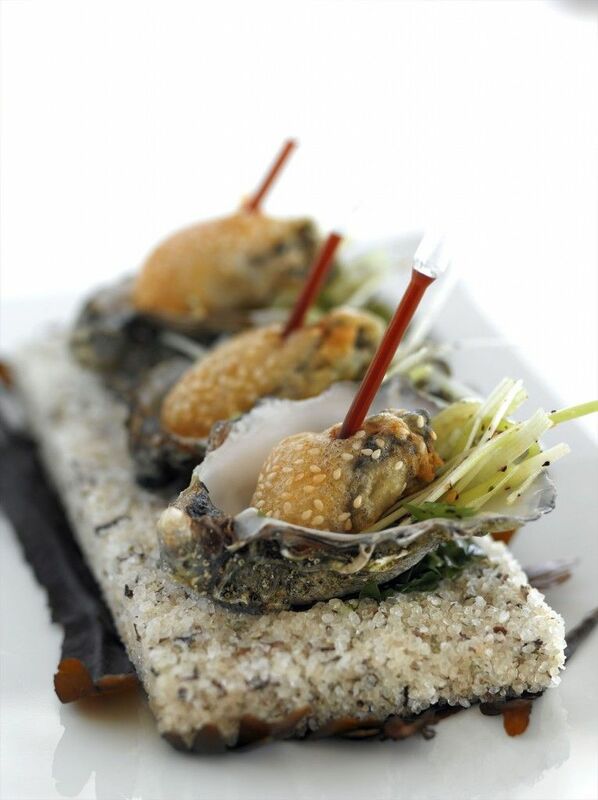 The waiter fills our champagne glasses while we peruse the mouth-watering menu and a waitress brings over a bread basket with the artisan breads of the day, along with the renowned seaweed butter. While my dinner guest, ravenous from a hard day in the office, chooses one of each bread, I select a rustic roll on which to sample this intriguing butter, which is salty and fresh. I look up to see my dinner guest seems to be devouring bread at an alarming rate and I remind him we have three courses to look forward to, but this does not deter him from signalling to the waitress for a second round. 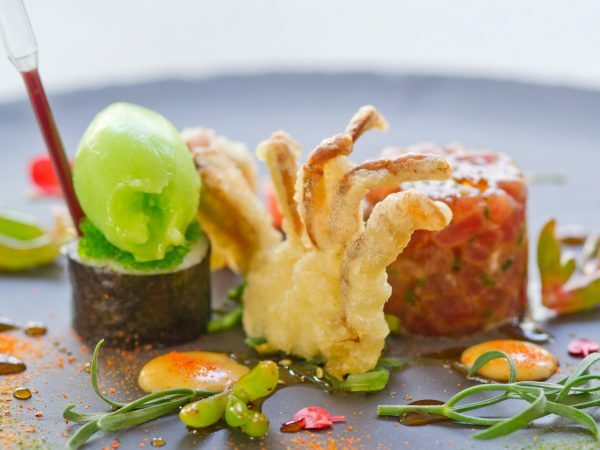 Our starters arrive; I have chosen yellowfin tuna tartar with soft shell crab tempura and my guest is served the artfully sculpted hand-dived Scottish scallop with Onsen quail eggs and crispy pork belly. 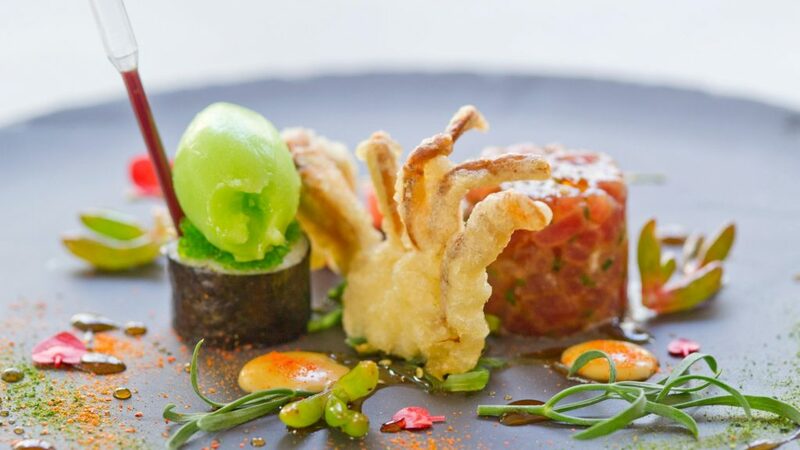 The crab is perfectly cooked and the wasabi sorbet adds a brisk dimension to the tuna. 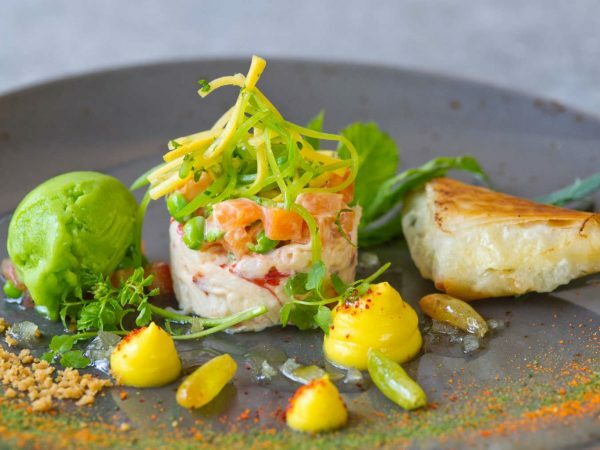 My dinner date’s delicate scallops are complemented by the robust flavours of the accompanying pork belly – he looks to be in food nirvana as he savours each mouthful. While we await our main course, the waiter tops up our champagne and offers us a choice from the wine list. Anyone who knows me will know I do not drink white wine; after many embarrassing incidents I have made the decision to avoid white wine in favour of red or champagne. 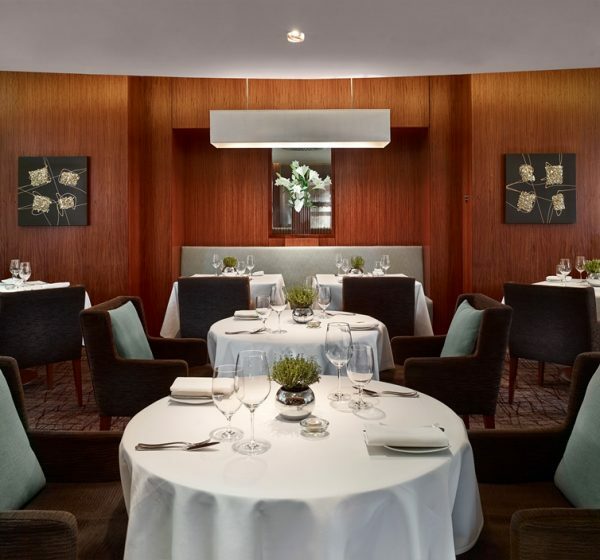 The waiter picks a fine light red to accompany our main courses which promptly arrives; for me, the whole Dover sole, pan-fried with a Dijonnaise sauce and, for my date, the slow cooked wild Arctic cod with Joselito chorizo carpaccio and squid a la plancha. Both look and smell divine and, gluttons that we are, we delve straight in. My sole slides effortlessly off the bone, the slight spiciness of the Dijon gives and interesting angle and depth to the dish. My date’s cod looks a perfect picture on the plate accompanied by the chorizo: neither dish lasts very long. While we sit there, quite satiated, the waiter tempts us with the dessert menu. I am not known for my sweet tooth but I cannot pass up the opportunity to try the chocolate brownie with salted caramel ice cream. My dinner date looks pleased that I am attempting dessert, not wanting to look like a pig and order dessert without me; he opts for the banana and pineapple delice. We chuckle to each other about what total gormandisers we have turned into and, in this vein of excess, we quaff another glass of champagne while they prepare our undoing in the kitchen. The desserts arrive, my partner’s looks amazing, but being a hater of bananas I pass on trying some. Mine looks somewhat of a mess BUT do not let appearances deceive – at the first mouthful, I am in heaven. The rich warm brownie melts in my mouth sharply, yet pleasingly, contrasted with the saltiness of the caramel ice cream and the caramel mousse gives another level of texture and taste in what can only be described as the best dessert I have consumed in London. In conclusion, One-O-One is well and truly a fabulous seafood restaurant, offering wonderful dishes that will amaze you (and may require penance afterwards: see brownie) and staff that are beyond professional (even when your partner has a bread fetish).